Just in the month of May, we have seen the attacks toward America's Christian heritage intensify. General Craig Olson stated at the congressionally supported National Day of Prayer Task Force that God guided him and strengthened his career and the he was a redeemed believer in Christ. Soon afterward, the anti-theists wanted to have him court-martialed. The bad news is most people believe that what is happening to their country is legal when, in fact, the opposite is true. The purpose of government is to ensure our rights, which God gave, not to steal them away. Just ask those who represent you to recite the oath that they took before serving "We The People." 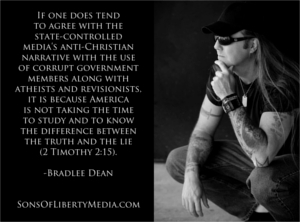 If one does tend to agree with the state-controlled media's anti-Christian narrative with the use of corrupt government members along with atheists and revisionists, it is because America is not taking the time to study and to know the difference between the truth and the lie (2 Timothy 2:15). I have a personal friend who is a former CIA agent, who told me that the two objectives of this criminal administration is to . By the way, that will never happen (1 Peter 1:25)! What you are seeing in America today is foreign governments at work [url=http://sonsoflibertymedia.com/2014/08/our-posterity-is-being-subjected-to-everything-protected-from-nothing/]assailing and indoctrinating the up and coming generations in hopes of overthrowing who you are. Now, I hope you can understand why William Penn stated, "Men must be governed by God or they will be ruled by tyrants."